A couple of weeks ago I spent a night under the stars on the shore of Lake Minnewanka. 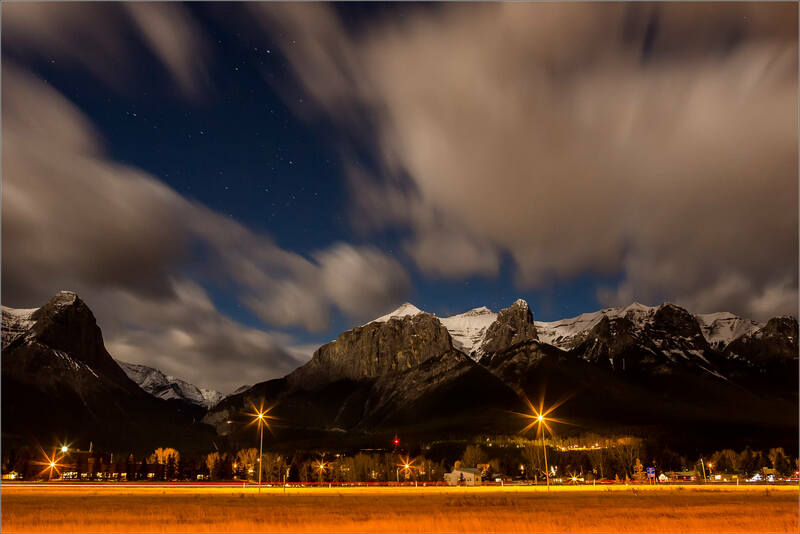 On the way there, as I passed through Canmore, the full moon was lighting up the mountains that connect the town with the sky. Here the tip of Ha Ling and the East End of Rundle (EEOR) were lit up during the long exposure I made looking across the Trans-Canada Highway and over the town. This entry was posted on November 21, 2016 by Christopher Martin. It was filed under Alberta, Landscapes, Night Photography and was tagged with alberta, Canmore, landscape photography, long exposure, moonlight, night. I hear the ice on Minewanka is solid enough to skate on now. I have a challenge for you… how can you capture, photographically, the incredible singing that that ice on that lake makes? I’ve never heard anything like it, anywhere else. We were just up around Upper Kananaskis Lake today. Have you ever tried to photograph the driftwood structures there (on the west shore)? My photos put them to shame, but they have such neat texture, form & shape. We hunkered down in them as the wind blasted the shoreline and the surf broke like ocean waves near the end of the day today. What a spectacular place to spend the night .